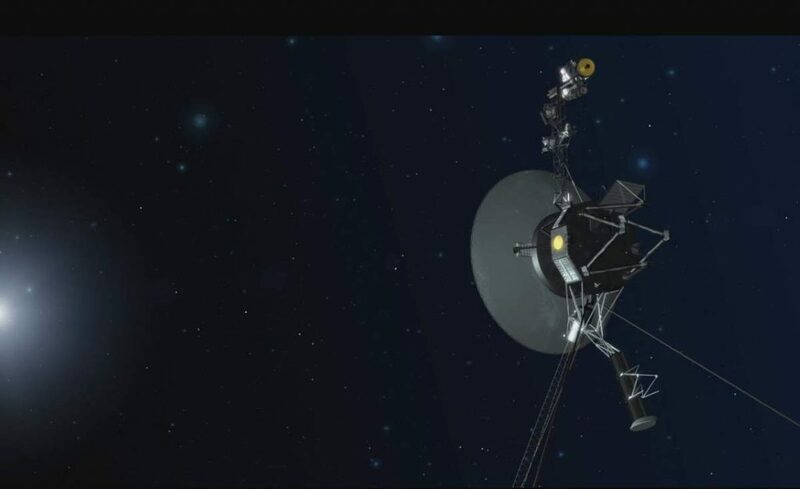 The two Voyagers and the New Horizons are still functioning and are regularly contacted by radio communication, while the two Pioneers are now derelict. These five space probes are leaving the Solar System because their velocity and direction are taking them away from the Sun, and at their distance, the Sun’s gravitational pull is not sufficient to pull these objects back or into orbit. In other words, they have enough escape velocity (the minimum speed needed for a free object to escape from the gravitational influence of a massive body) to leave the Solar System. * An Astronomical Unit (AU) is the average distance between Earth and the Sun, which is about 93 million miles or 150 million kilometers. Astronomical units are usually used to measure distances within our Solar System. Pioneer 10 was launched on March 2, 1972. It was the first spacecraft to make direct observations and obtain close-up images of Jupiter, and by the time it reached its target, it had been traveling through space for 21 months, traversing regions of the solar system never before explored by human-made robots. It made its closest approach to the gas giant on December 3, 1973, passing within 81,000 miles (130,000 km – about one-third of the distance between the Earth and the moon) of the cloud tops. Thereafter, Pioneer 10 became the first spacecraft to travel through the Asteroid belt, and also the first artificial object to achieve the escape velocity that will allow it to leave the Solar System. After more than 30 years, Pioneer 10’s last, very weak signal was received on 23 January 2003. NASA engineers report that Pioneer 10’s radioisotope power source has decayed, and it may not have enough power to send additional transmissions to Earth. Now it is heading in the direction of Aldebaran (68 light years away) in the constellation of Taurus. If Aldebaran had zero relative velocity, it would require more than two million years for the spacecraft to reach it. Pioneer 11 was launched on April 6, 1973, to study the asteroid belt, the environment around Jupiter and Saturn, solar wind and cosmic rays. It flew past Jupiter in November and December 1974. During its closest approach, on December 2, it passed 42,828 kilometers (26,612 mi) above the cloud tops, way closer than its sister, Pioneer 10. The probe obtained detailed images of the Great Red Spot, transmitted the first images of the immense polar regions, and determined the mass of Jupiter’s moon Callisto. 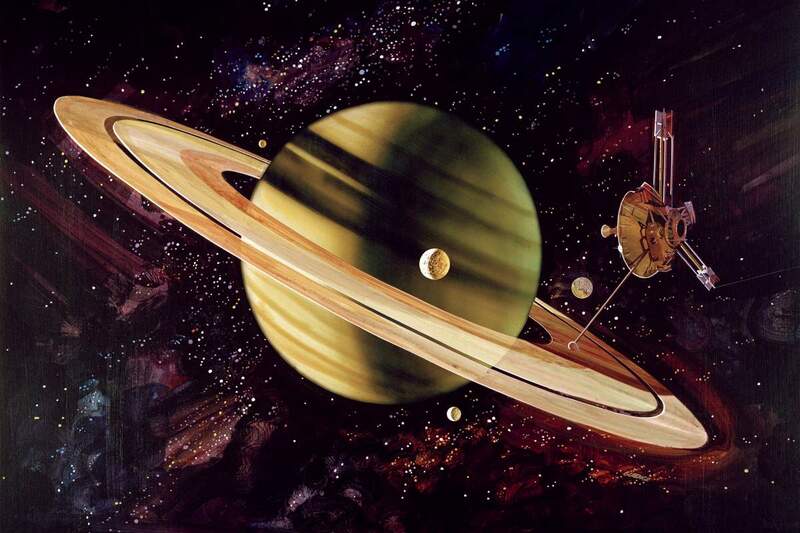 Pioneer 11 passed by Saturn on September 1, 1979, at a distance of 21,000 km (13,000 mi) from Saturn’s cloud tops. It became the first human-made object to fly past Saturn. By this time Voyager 1 and Voyager 2 had already passed Jupiter and were also en route to Saturn (they were way too fast than the Pioneers), so it was decided to target Pioneer 11 to pass through the Saturn ring plane at the same position that the soon-to-come Voyager probes would use in order to test the route before the Voyagers arrived. If there were faint ring particles that could damage a probe in that area, mission planners felt it was better to learn about it via Pioneer. Thus, Pioneer 11 was acting as a “pioneer” in a true sense of the word; if danger were detected, then the Voyager probes could be rerouted further away from the rings, but missing the opportunity to visit Uranus and Neptune in the process. But Pioneer 11 detected no danger. By 1995, Pioneer 11 could no longer power any of its detectors. NASA officially ended Pioneer 11’s mission on September 30, 1995, after receiving the spacecraft’s last transmission. Now it is headed toward the constellation of Aquila, northwest of the constellation of Sagittarius. Barring an incident, Pioneer 11 will pass near one of the stars in the constellation in about 4 million years. The most distant human-made object from Earth, Voyager 1 was launched on September 5, 1977. It’s also NASA’s fastest space probe. Having operated for more than 41 years as of January 2019, the spacecraft still communicates with the Deep Space Network to receive routine commands and return data. The probe’s objectives included flybys of Jupiter, Saturn, and Saturn’s largest moon, Titan. While the spacecraft’s course could have been altered to include a Pluto encounter by forgoing the Titan flyby, exploration of the moon, which was known to have a substantial atmosphere, took priority. Voyager 1 studied the weather, magnetic fields, and rings of the two planets and was the first probe to provide detailed images of their moons. After completing its primary mission with the flyby of Saturn on November 12, 1980, Voyager 1 became the third of five artificial objects to achieve the escape velocity, which will allow them to leave the Solar System. On August 25, 2012, Voyager 1 became the first spacecraft to cross the heliopause and enter the interstellar medium. In a further testament to the robustness of Voyager 1, on November 28, 2017, the Voyager team fired a set of thrusters aboard it successfully for the first time since November 1980, after 37 years without use. Back in 1990, in order to save power, engineers turned off the spacecraft’s camera. But, before that, it was commanded by NASA to turn its camera around and to take a photograph of Earth across a great expanse of space, at the request of Carl Sagan. Taken from a record distance of about 6 billion kilometers (3.7 billion miles, 40 AU) from Earth, the photo known as the Pale Blue Dot. In the photograph, Earth is shown as a fraction of a pixel (0.12 pixel in size) against the vastness of space. Voyager 1 is headed towards is headed toward an encounter with AC +79 3888, also known as Gliese 445, located 17.6 light-years from Earth. In about 40,000 years, Voyager 1 will be closer to this star than our own sun. Voyager 2 was launched on August 20, 1977, 16 days before its twin, Voyager 1, on a trajectory that took longer to reach Jupiter and Saturn but enabled further encounters with Uranus and Neptune. As of 2019, it is still the only spacecraft to have visited either of these two ice giant planets. Voyager 2’s closest approach to Jupiter occurred on July 9, 1979. The probe came within 570,000 km (350,000 mi) of the planet’s cloud tops. Its closest approach to Saturn occurred on August 26, 1981. The closest approach to Uranus occurred on January 24, 1986, when the spacecraft came within 81,500 kilometers (50,600 mi) of the planet’s cloud tops. Voyager 2 also discovered 11 previously unknown moons. The mission also studied the planet’s unique atmosphere, caused by its axial tilt of 97.8°; and examined the Uranian ring system. Following a mid-course correction in 1987, Voyager 2’s closest approach to Neptune occurred on August 25, 1989. The flyby occurred about 4950 kilometers (3000 mi) above the north pole of Neptune. Voyager 2 discovered previously unknown Neptunian rings and confirmed six new moons. Each Voyager space probe carries a gold-plated audio-visual disc in the event that either spacecraft is ever found by intelligent life-forms from other planetary systems. The discs carry photos of the Earth and its lifeforms, a range of scientific information, spoken greetings from the people (e.g. the Secretary-General of the United Nations and the President of the United States, and the children of the Planet Earth) and a medley, “Sounds of Earth”, that includes the sounds of whales, a baby crying, waves breaking on a shore, and a collection of music, including works by Johann Sebastian Bach, Wolfgang Amadeus Mozart, Blind Willie Johnson, Chuck Berry’s “Johnny B. Goode”, Valya Balkanska and other Eastern and Western classics and ethnic performers. Voyager 2 is not headed toward any particular star, although in roughly 40,000 years it should pass 1.7 light-years from the star Ross 248. If undisturbed for 296,000 years, it should pass by the star Sirius, the brightest star in the night sky, at a distance of 4.3 light-years (Sirius is 8.6 light years from the Sun). The last of the five space probes leaving the solar system, NASA’s New Horizons probe started its fantastic voyage of exploration on January 19, 2006, aboard an Atlas V rocket. It swung past Jupiter for a gravity boost and scientific studies in February 2007, and conducted a six-month-long reconnaissance flyby study of Pluto and its moons in summer 2015, culminating with Pluto closest approach on July 14, 2015. 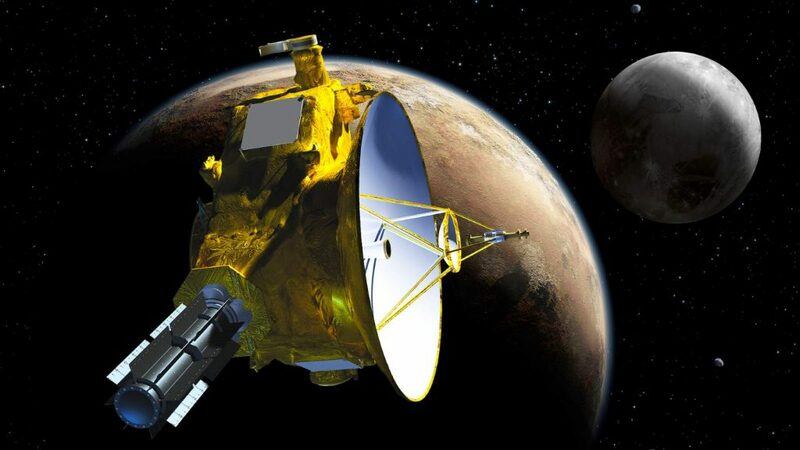 New Horizons flew 12,500 km (7,800 mi) above the surface of Pluto, making it the first spacecraft to explore the dwarf planet. After completing Pluto flyby, it made a total of four trajectory changes in October and November 2015 to place itself on a course towards Ultima Thule, a trans-Neptunian object Notes 2 located in the Kuiper belt Notes 3. The flyby occurred on January 1, 2019, when the spacecraft was 43.4 AU from the Sun. Well, it’s complicated. Informally, the term “solar system” is often used to mean the space out to the last planet – Neptune. Some scientists think that the solar system goes out to the Oort Cloud, the source of the Comets. The inner edge of the main part of the Oort Cloud could be as close as 1,000 AU (Astronomical Unit, the distance between the Earth and the Sun, which is around 93 million miles or 150 million kilometers) from our sun. The outer edge is estimated to be around 100,000 AU. 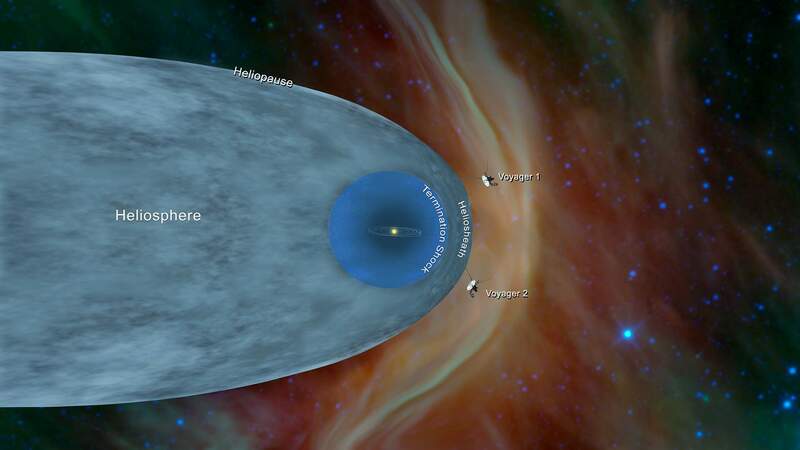 Before the Oort cloud, there’s a region called heliopause (the heliosphere is the bubble; the heliopause its edge). The heliopause is the theoretical boundary where the Sun’s solar wind is stopped by the interstellar medium; where the solar wind’s strength is no longer great enough to push back the stellar win. The crossing of the heliopause should be signaled by a sharp drop in the temperature of charged particles, a change in the direction of the magnetic field, and an increase in the amount of galactic cosmic rays. Solar System in logarithmic scale. Image credit: NASA. The overall shape of the heliosphere resembles that of a comet – being approximately spherical on one side, with a long trailing tail opposite, known as the heliotail. Since these five spacecraft are going on different paths, they’ll leave the heliosphere at different distances from the Sun. Furthermore, changes along with the sun’s 22-year solar cycle, shrinking and growing with the solar wind. According to 2017 research, the tail of the heliosphere is about 220 AU from the sun. This makes almost impossible to tell when Pioneer 10, 11 and New Horizons will enter interstellar space. If the ever-changing heliosphere remains static (a very unlikely event), Pioneer 11 will be the next spacecraft to enter the interstellar space in 2027, followed by New Horizons in 2043. 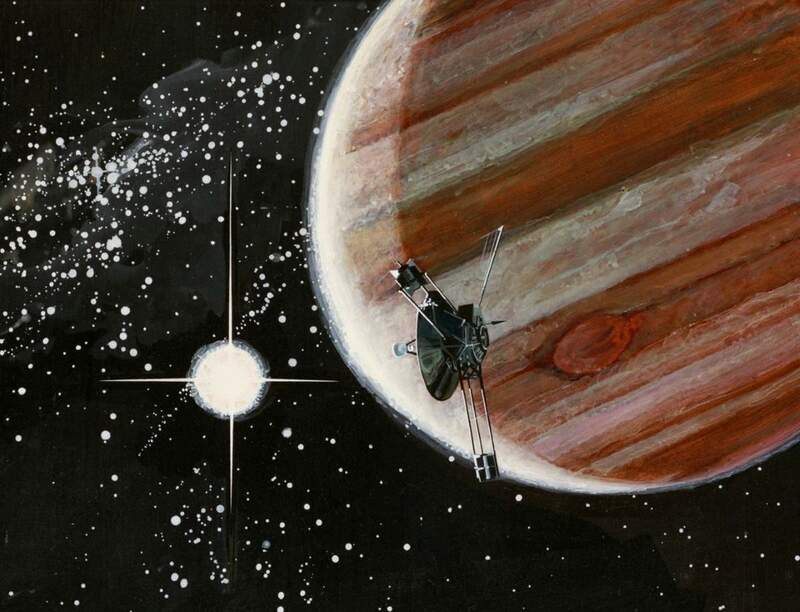 Pioneer 10, the first of the five spacecraft to launch, will be the last to leave the heliosphere, in 2057. The heliosphere is the vast, bubble-like region of space which surrounds and is created by the Sun. In plasma physics terms, this is the cavity formed by the Sun in the surrounding interstellar medium. The “bubble” of the heliosphere is continuously “inflated” by plasma originating from the Sun, known as the solar wind. Outside the heliosphere, this solar plasma gives way to the interstellar plasma permeating our galaxy – the Milky Way. A trans-Neptunian object (TNO) is any minor planet in the Solar System that orbits the Sun at a greater average distance than Neptune, which has a semi-major axis of 30.1 Astronomical Units (AU). An Astronomical Unit is the average distance between Earth and the Sun, which is about 93 million miles or 150 million kilometers. The first trans-Neptunian object to be discovered was Pluto in 1930, which was considered as the ninth planet of the solar system for a long time, until 2006. It took until 1992 to discover a second trans-Neptunian object orbiting the Sun directly, 15760 Albion. The most massive TNO is Eris, followed by Pluto. 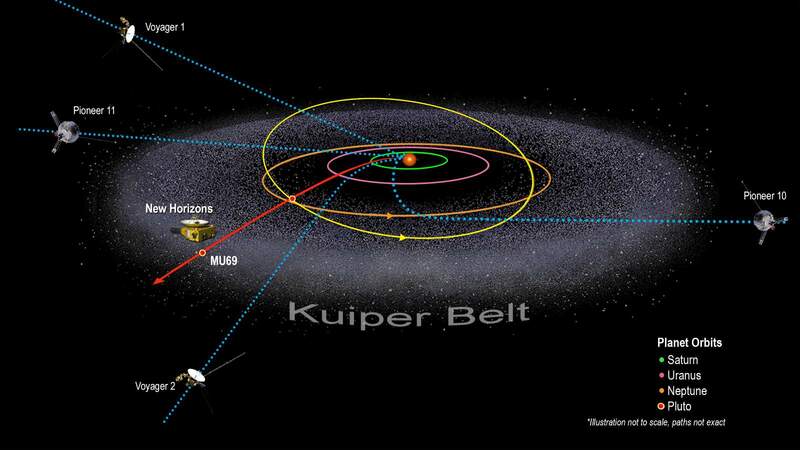 The Kuiper Belt stretches from about 30 (the orbit of Neptune) to about 55 astronomical units (AU) from the Sun. It is similar to the asteroid belt, which is located roughly between the orbits of the planets Mars and Jupiter but is far larger- 20 times as wide and 20 to 200 times as massive. Like the asteroid belt, it consists mainly of small bodies or remnants from when the Solar System formed. Nice Information … If planets were as close as the moon to the earth. Or If the moon were replaced with some of our solar system planets like Jupiter, Mars, Saturn, Uranus. How would they look like? In our article, we will show you, what the planets of the Solar System would look like from Earth if they were the same distance as the Moon, some 386,000 kilometers.